Now the Holy War would be a title that most would think would be affixed to a rivalry between two schools of competing religions, say Notre Dame, America’s preeminent Catholic university, and Brigham Young University, a Mormon University located in Provo, Utah, but that would only be half-right. That title actually belongs to the rivalry between the Utes of the University of Utah and the Cougars of BYU. It is not clear how the name originated, but what is clear is why this rivalry has earned that name. The annual, well at least it was annual, game between the Utes and Cougars has earned this title because, BYU is the flagship university of the Church of Jesus Christ of Latter Day Saints, and Utah is the state school. That’s right. This game is a battle of church vs. state. The two adversaries first met on the gridiron on April 6, 1896 when BYU, then known as “Brigham Young Academy,” took a trip up north from Provo, Utah to Salt Lake City to take on the Utes in a scrimmage. Utah ended up winning the game 12-4, but the real news came after the game when, according to byucougars.com, a group of Salt Lake locals surrounded fans of BYA and began to harass them. The BYA fans eventually had enough, and a brawl began. And thus, so did the Holy War. The Cougars and Utes met five more times during the 1890s, two more times in 1896, twice in 1897 and once in 1898, with the schools splitting the series at three games apiece. It would be 24 more years, and a name change for BYA before the two teams would meet again. 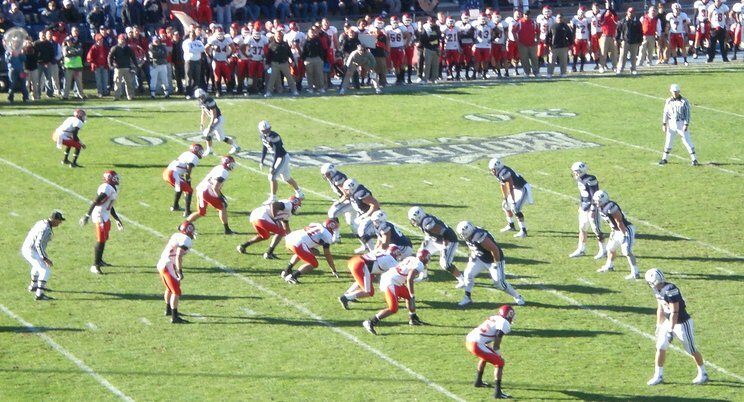 The University of Utah Utes and the Brigham Young University Cougars square off in the 2007 Holy War at LaVell Edwards Stadium in Provo, Utah. BYU won the game 17-10. Picture courtesy of Cortney Smith on Flickr. In 1903, BYA was dissolved, and reformed as two separate institutions, Brigham Young High School, which dissolved in 1968, and BYU, which. From 1899-1921, BYU did not field a football team, and the rivalry was put on hiatus. In 1922, the Cougars fielded a team once more, and the rivalry resumed with a 5-0 Utah victory, which would be the first of 20 straight years that Utah would leave the field without losing to the Y. From the 1898 meeting through 1927, the Utes won seven straight games, outscoring BYU 191-13, but in 1928, the Cougars held the Utes scoreless. The trouble was, the Utes did the same to BYU. That game ended in a 0-0 tie. That would not derail Utah, however, as the Utes began another win streak the next year, this one lasted nine years, from 1929-37. There would be two more ties and two more Ute victories before the Cougars would notch their forth win in the now 47-year-old rivalry. At this point the teams faced each other 27 times. In 1942, the Cougars finally ended their dry spell and beat Utah, 12-7. This would be the final game until 1946, as BYU did not field a team from 1943- 45 due to America’s involvement in World War II. When the feud resumed again in 1946, the Utes also resumed winning, as it would be 12 straight years that the series would see either a Utah victory or a tie. BYU won in 1958, but they wouldn’t experience victory again until 1965. Between those two dates, Utah won six straight games. 1965 began the Cougars’ luck began to change, they were able to rattle off three straight victories from 1965-67, but Utah would respond with four straight wins of their own. So far, Utah had completely dominated the series with a record of 41-8-4. That advantage that Utah had felt for so long, would become a rare and cherished feeling, over the next 21 years, the Utes would only taste victory twice, thanks to legendary BYU head coach LaVell Edwards who was able to completely turn the program around. During those 21 years, the Cougars were able to win six, nine and four straight games. The rivalry’s streaky past continues to this day. Utah was able to achieve a four-game winning streak twice and also a three-game winning-streak, and BYU has had a couple of back-to-back wins. Utah currently holds a 23-game advantage in the series, with a record of 57-34-4. This rivalry, which has seen its fair share of crazy games, including a game in 2012, when Utah fans twice rushed the field at Rice-Eccles Stadium, the home of Utah football, prematurely, has been put on hiatus until 2016, due to Utah scheduling the University of Michigan for a home-and-home series in 2014 and 2015. Fans, however, are not upset about this. Cougar fans are not upset about this either. Beckstead described one game in particular that went too far. However, that doesn’t mean the two teams will suddenly start enjoying each other. With as much hate as these two schools have for each other, and how some fantastic games have happened because of the Holy War, let’s hope that the brief hiatus does not diminish the Holy War and lead to it being forgotten. In this vlog, I talk about the Holy War, what it is and why it is great, between the University of Utah Utes and the Brigham Young University Cougars. The video of Max Hall saying that he hates Utah can be found here. The video of Utah fans prematurely rushing the field (only twice, not three times like I said in the video) can be found here. How is (Insert Rivalry Here) forgotten? When one comes west of the Missouri River, they may not realize what is the oldest, and one of the most highly contested rivalries in that region. Well, all it takes is a trip to Fort Collins, Colo., or Laramie, Wyo., to figure that out. In those towns, homes of Colorado State University Rams and the University of Wyoming Cowboys, respectively, that are separated by about an hour and fifteen minutes on U.S. Highway 287 or an hour and a half on Interstates 25 and 80, nothing is better than beating the Rams or Cowboys. The Border War is not only the oldest west of the Missouri, it is the second-oldest west of the Mississippi (to the Border Showdown) and has been contested since 1899 when Wyoming took a trip down to Fort Collins and lost to the Rams, 12-0. The schools have met each year, with the exception of 12 years, for a total 104 times since that day in late November 1899. Early on, it did not even seem like this was much of a rivalry. The then Colorado Agricultural College Aggies won six out of the first seven games against the Cowboys, and the one that the Aggies did not win was the series’ first game in Laramie, and it ended in a 6-6 tie. In 1910, the game was once again played in Laramie, and the Cowboys secured their first win in the series by shutting out CAC, 10-0. The Cowboys would travel down to Fort Collins the next season and gain their first road victory in the Border War by a score of 27-0. Winning would become very rare for the Cowboys, as over the next 31 match-ups,as the Aggies, who in 1935 would become the Colorado State College of Agriculture and Mechanical Arts, or Colorado A&M for short, would go on to win 24 of the games, tie four, and only lose three games. That included three five-game winning streaks and two-four game winning streaks for CAC/CAM. It was then that the Aggies fortunes turned sour, because from 1949 until 1973, the Cowboys ruled the War, winning 21 of the 25 gams during that time, which oversaw the change of Colorado A&M to Colorado State University and the adoption of the Ram as the mascot in 1957. That stretch of absolute control included winning streaks of 10 games and seven games. Those winning streaks were separated by a single win for the Rams, a gigantic upset, where the unranked Rams beat the #10 Cowboys 12-10 in Fort Collins. The Bronze Boot on display at the University of Wyoming in Laramie, Wyo., in 2007. Picture courtesy of Wikimedia Commons. 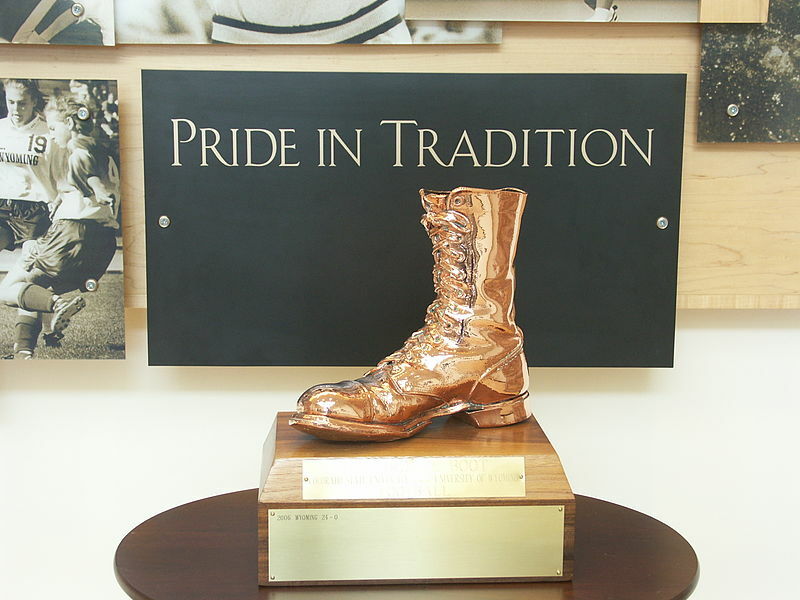 Since the institution of the Bronze Boot, the rivalry has been much more balanced. The Cowboys finished that seven-game win streak in 1974, and since then, neither school has had a winning streak of more than four games (CSU: 1999-2002, Wyoming: 2009-present), although Wyoming has a chance to change that this weekend. This rivalry also has one of the more unique traditions in all of college sports. Each year, the Friday before each game, the ROTC detachment from the visiting school runs from their stadium to the Colorado-Wyoming border, and hands off the game ball to the ROTC detachment of the home school, who then runs it back to their stadium. And this is no small jog. The Colorado-Wyoming border rests 39 miles from Sonny Lubick Field at Hughes Stadium, Colorado State’s home stadium, and 26 miles from War Memorial Stadium, Wyoming’s home stadium. Now, it can be said that this rivalry is forgotten by most of the country because in most years, Colorado State and Wyoming are just, frankly, not very good. But, when the two teams meet on the gridiron each fall, the atmosphere is electric, regardless of the records of the two teams. None of that matters. All that matters to the players is getting their hands on the Bronze Boot so that it stays in Fort Collins or Laramie for the next 12 months. Colorado State and Wyoming will meet on the gridiron for the 105th time this Saturday. The game is sure to be intense, and hopefully will spark a resurgence in the rivalry that will ensure that it will never be forgotten. Follow Forgotten Rivalries on Twitter! Like Forgotten Rivalries on Facebook!